Hurricane Katrina was one of the largest natural disasters to hit the United States in recent memory, and flooding is still an issue along the Louisiana coast. The shoreline there is disappearing faster than any other in the country as its soft soil sinks and sea levels rise, fueled by climate change. There are efforts underway to reclaim much of that land, but state officials recently acknowledged that they won’t be able to rescue all of it. 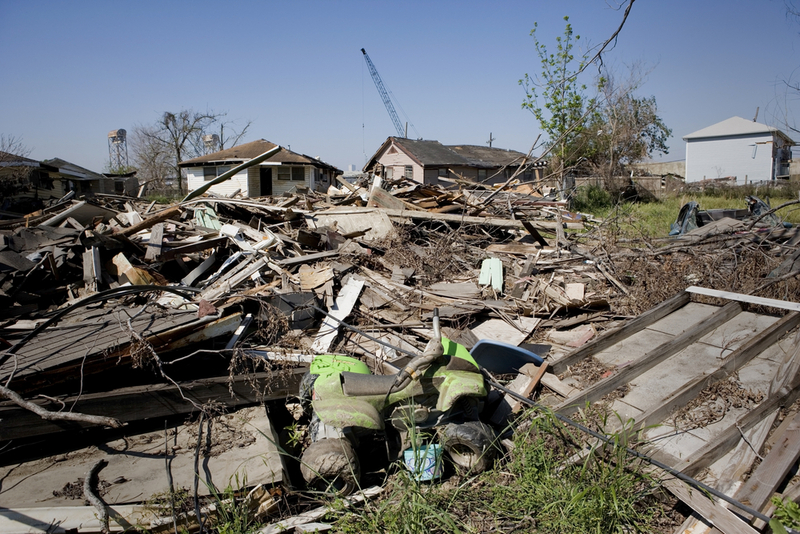 Tegan Wendland, coastal reporter for WWNO in New Orleans, joins Ira to discuss how state and federal governments are ill-prepared to handle the displacement of millions of people living along these imperiled coastal areas. Plus, how warmer weather in the Arctic is leading to more greenhouse gases in the atmosphere. Tegan Wendland is a coastal reporter at WWNO in New Orleans, Louisiana. IRA FLATOW: This is Science Friday. I’m Ira Flatow. It is an unfortunate fact that ever since Hurricane Katrina, New Orleans and flooding have become synonymous. But flooding is much more of a long term problem down there. The soft soil of the delta coupled with sea level rise has some coastal parts of Louisiana disappearing faster than any others in the country. Efforts are underway to reclaim some of that land, but state officials have said they won’t be able to rescue all of it. And a recent study in Nature Climate Change estimates that by the year 2100, 13 million people could be displaced as a result of sea level rise, perhaps even sooner if you live in parts of the Louisiana Delta. Joining me now to bring us that story as well as other short subjects in science is my guest Tegan Wendland, coastal reporter for member station WWNO in New Orleans. Welcome, Tegan. TEGAN WENDLAND: Thanks for having me. I’ve only been listening since I was nine, so it’s not like this is a lifelong dream or anything. IRA FLATOW: [LAUGHS] You’re very kind. I hope your mother’s listening today! TEGAN WENDLAND: I think she is, up in Wisconsin. IRA FLATOW: Be a nice present for her Mother’s Day. Well let’s talk about it. How rapidly are stuff deteriorating down there? TEGAN WENDLAND: Well, they say a football field an hour. And as you mentioned, there are a number of different forces at play here. Partly the land is sinking. It’s naturally this deltaic landscape built by the Mississippi River over millions of years. So it’s naturally just sort of sinking. But in coming years, rising seas will be a bigger contributor to land loss here. So the state’s been trying to restore and rebuild as much as we can through marsh creation projects and rebuilding barrier islands. But officials here are finally acknowledging that we’re not going to be able to save all of the coast with these restoration efforts, that some of the coast will wash away and be gone forever. So the next challenge now is to get people out of harm’s way, because we predict tens of thousands along the coast will have to move in the coming decades. And that’s just this region, of course. This is playing out all over the nation and world. IRA FLATOW: Are there some communities already relocating? TEGAN WENDLAND: Yeah, it’s happening already, all over the country. This other report came out this week by the Center for Progressive Reform looking at 17 communities that are already in the process of relocating. It happens that they’re all Native American communities. The biggest challenge is really finding and acquiring new land to move to. And the hardest part of that is that it’s expensive and there’s no money for it. There’s no real set federal or state funding streams to do that at this point. There was a resiliency grant given out by the Department of Housing and Urban Development about a year ago to several communities throughout the US. But other than these sort of little pots of money, there’s no set funding stream. So I spoke with one of the authors of this study, Loyola University Law Professor Rob Verchick, and he laid out some of those challenges, if you could listen to that clip now. – Think about it. If there were a foreign power that were stealing land and destroying towns and villages in coastal United States, we would have an orchestrated federal plan to address that. Right now, all we have is a scattershot approach. Different agencies have grants available for things called resilience or sometimes coastal restoration. But they’re usually very small. IRA FLATOW: Yeah, this is what goes unspoken, is how expensive it is to move all these people. When people talk about climate change or sea level rise, they talk about what it’s going to cost to do things or not to do things, whether the public is going to be impacted. But they don’t on the other side of the equation, speak about what it’s going to cost to move all these people. TEGAN WENDLAND: Right, yeah. Another professor I spoke to called it the next great migration. And this report in Nature Climate Change that you referenced in the intro kind of looked at where people are going to be moving and what cities would be seeing the biggest gains and losses. Like you said, 13 million people are expected to have to move away from coastal US counties by 2100. So that’s on the near horizon. And this was the first study to really model this. It found that people tend to move short distances. They tend to stay near family and near economic opportunities and jobs. We really saw that play out here after Hurricane Katrina when many folks moved from the southern parishes such as Plaquemines and St. Bernard. We have parishes instead of counties here. And they moved up to parishes that were just slightly north of there. And they tried to sort of stay around where their families and jobs were. So this particular study just made some estimates as to which cities would be the biggest losers and gainers. The biggest population losers projected in coming years are Miami, New Orleans, and the Norfolk area. And the biggest gainers would be Atlanta, Austin, and Orlando, cities that are still fairly coastal but maybe a little bit safer. IRA FLATOW: Yeah. All right, let’s move on to the next story. There’s a new report that highlights how warming weather in the Arctic is making climate change even worse. TEGAN WENDLAND: Right, yeah. The permafrost there is melting. Warming weather means more warming weather, I guess. And basically as the permafrost melts, it’s ground that’s usually frozen indefinitely. As that happens, the microbes in that soil sort of wake up and they start chomping away at the old vegetation, thousands of years old. And as they digest that vegetation, they produce either carbon dioxide or methane as waste. And then that methane makes its way to the surface and escapes into the air. And this new study published in the Proceedings of the National Academy of Sciences found that the Arctic is actually becoming a huge source of carbon as a result. So that’s speeding up global warming. IRA FLATOW: So it’s not that it’s just sitting there on the ground. It’s the bacteria that are chomping on the defrosting tundra and releasing all the CO2 in the methane and things like that. TEGAN WENDLAND: Right, it’s that interaction there with the microbes sort of releasing the CO2. And this is actually kind of a big deal, because previously we’ve thought of the Arctic as a carbon sink, that it stores carbon, and that it removes more from the air than it emits. And that’s largely because there’s not really a growing season there. So this study really tests that theory. It found that CO2 from the tundra increased by about 75% since the 1970s. IRA FLATOW: I wouldn’t expect this new EPA to do a lot to combat these issues, would you? TEGAN WENDLAND: Well, I can’t really offer an opinion on that as a reporter. But the EPA recently decided to overhaul its advisory board, or one of its advisory boards. And a spokesman for the EPA told The New York Times that they’d replace those scientists with industry representatives. The EPA is responsible for setting environmental regulations. And this board sort of makes sure that those regulations are grounded in science. And the new EPA head, Scott Pruitt, decided not to renew contracts for half of the people on that board, which is kind of unprecedented, just to see that number of people let go at the same time, even though they were term limited. And some environmentalists kind of see this as the latest in a pro industry push. Trump has said he wants to radically remake that agency. He removed references to climate change from the EPA website just after he took office, or at least called for them to do so. And he’s pushed for deeper cuts to its budget and said he wants to rollback Obama era regulations. IRA FLATOW: Well, thank you very much. It’s great to have you on. Tegan Wetland, coastal reporter for our member station, WWNO in New Orleans.